This is the second version and a complete solution for jQuery fullcalendar plugin. Most admin themes on themeforest use this plugin and they are static updated, with this solution now they can get dynamic. It’s possible due to the php class and jQuery plugin that this product contains in two demo versions. 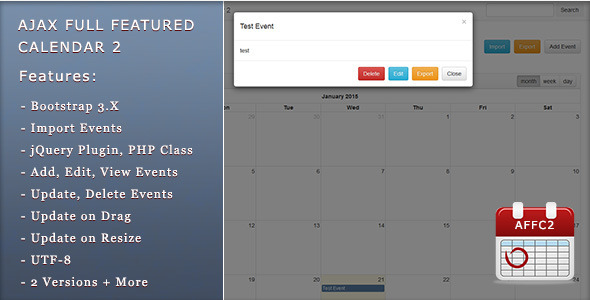 The PHP class and the js plugin retrieves all events to the calendar and the events are updated on drag and on resize without page reload or redirects and on each event click is displayed the event information that can be edited, exported or deleted.